I think you get the point, but wait, did I just say Google profile? Well, yes I did. Much like McDonald's uses golden arches for french fries, and Starbucks uses green stirs with the siren tip... you too should keep your brand image attached/connected at all points of consumer contact. Did you know that your Google profile can be just as powerful as your Facebook timeline? It's true, Google's new profile has a similar layout as the Facebook timeline. The biggest differences (cosmetically speaking) between your Google profile and the Facebook timeline are the dimensions for each graphic you have control over – your photos. Unlike the Facebook, the Google profile lets you use an animated .gif (graphics that have motion). The Google profile is not intended to be a Facebook page, however with the addition of Google+ you can do really well connecting with your circle of friends, customers, and first time visitors. If you choose to use animated graphics (.gif), you can give a bigger dose of your brand to those who visit your profile. 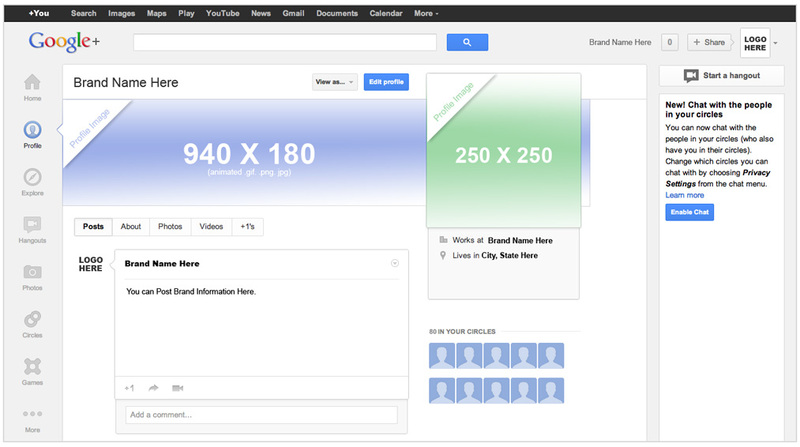 I've included the exact Google profile dimensions in the infographic so you can enhance your Google profile. Look at this animated Google profile we created for Troy Richard Salon. Remember when I said you are probably using Facebook as a point of contact for your marketing? Well, you can, but unfortunately the large Facebook timeline cover photos do not allow you to use the animated .gif file like Google's profiles do, however you can ensure that the way your brand looks is consistent –making curtain that your facebook page delivers a better first impression too. Like the Google profile, it's important that you use the proper measurements. Look at this facebook timeline we created for Troy Richard Salon. Oevae Marketing Consultants helps the small business owner enhance brand exposure, giving your company the recognition it deserves. Not doing so could mean that your brand message gets lost somewhere between your business card and Google profile. Instead, make sure your brand can easily be recognized, and inspires your targeted audience to remember who you are and what you brand stands for across all platforms.